Dotted rhythms are a curious phenomenon from several different points of view: technical, musical, mathematical, ………… and perhaps even philosophical. What then is the significance of dotted rhythms in the musical language? Which bowings are best and why ? Why are they considered “French Style”? Are they always “French Style”? And ultimately even: what is a dotted rhythm? The dotted micro-units of two notes (or three notes in compound time) are asymmetrical, lopsided, and unbalanced. Undotted rhythms can be compared to normal walking or running: the pace can be fast or slow but the rhythm of the steps is regular and metronomic. In other words, each step is equidistant from the one before it, each step coincides with a rhythmic pulse, and no pulses are “missing”. In contrast to this, dotted rhythms are the equivalent of skipping, dancing, or (in extreme cases) of Monty Python’s “Silly Walks”. The simple fact of adding the dot gives a new and instantaneous vigour and interest to the note progression: now one note (the short one) is an upbeat to the next and the rhythm comes alive. Dotted rhythms add interest, expression and tension/release to music. The particular tension and release patterns inherent in dotted rhythms have parallels in human movement: as mentioned above, adding the dot is what we do when we change from running to skipping, from walking to lilting, from marching to dancing. Undotted rhythms are more mechanical, regular, steady and serious. When we are working hard, we are often “undotted” (participating in a race, or doing “serious” training, for example). When we are fooling around, literally “playing” (or dancing) we are often more dotted. Our english word “dotty” – normally meaning a sort of charming, silly, harmless craziness or eccentricity – is also often a good description of the effect of dotted rhythms. The dot usually gives music more character, most often making it more graceful, playful and delightful. To illustrate this influence of the dot, try playing Fred Wilson’s Hornpipe (Irish folkmusic) to children, firstly without, and then with the dotted rhythm. Normally they will squeal with laughter and delight with the dotted version! At slower speeds, dotted rhythms can give a mannered, courtly, lilting, even teasing character. This is especially so when we wait – to great effect – till the absolute last moment, before playing the short note (see “double-dotting” below). The Allemande from Bach’s 5th Cello Suite illustrates well this type of dotted rhythm. At faster speeds, dotted rhythms usually give a skipping, rollicking, sparkling, sprightly, crisp, playful, dancing character. The first movement of Schubert’s Piano Trio nº 1 in Bb is full of examples of this type of dotted rhythm. It can be very easy to inadvertently diminish the dotted effect by allowing our short notes to get longer and thus making a 2+1 triplet figure instead of the tighter, crisper 3 + 1 dotted quaver-semiquaver figure. A piece to play to work on this potential problem is the Courante from Bachs D minor Partita for solo violin, in which the alternation of triplet quavers with dotted quaver/semiquaver figures is constant. With the exception of the ultra-intense “Beethovenian” dot mentioned above, dotted rhythms tend to lighten the music, independently of whether the movements are fast or slow. The frequent use of dotted rhythms, especially in Baroque music, is considered “French Style” because of the character it gives to the music: sprightly, capricious, flirting, lightfooted or nervous, impetuous, excitable. When Paul Tortelier used to take his little trade-mark skip up onto the soloist podium, we could also call this an excellent example of a “French dot”. Undotted rhythms on the other hand, at any speed, have a more steady, predictable character. They can be slow and stately, or sprinting and driven, but are usually more “serious” and therefore referred to (in Baroque music) as “Germanic Style”. Look at the following table and you can see why Bach’s Fifth Cello Suite is considered to be in the “French Style”. It has more dotted rhythms than all the other suites combined ! When we try and count exactly how many dotted rhythms there are in a certain piece or movement, we quickly realise that, unfortunately, the definition of what is (and what isn’t) a dotted rhythm is not actually completely precise. This is why in the above table some numbers are in brackets (these numbers include the “doubtful dots”). See below for a further discussion about this subject. In Bach’s Partitas and Sonatas for Solo Violin several of the movements also stand out for being extremely dotted: the First Movements of the B minor Partita and the C major Sonata each have more than 100 dotted rhythm figures. What really gives a strong “French style” however is when we decide to “double dot” these dotted rhythms. This is optional, but was in the Baroque period perhaps an automatically assumed way of playing these rhythms, in the same way that we nowadays automatically (hopefully) play “swing” music syncopated, even though is traditionally written out “square”. Thus in some Baroque music we can choose between playing in the German style (as written) or in the French double-dotted style in which the semiquavers (16th notes) are played late and as semidemiquavers (32nd notes) as in the following examples taken from Bach’s Fifth Suite. Actually, this “double dot” is often not what it says it is. Rather than playing the short note twice as short as written, we often make a compromise which converts the semiquaver (16th note) into a triplet semiquaver (a 24th note?) rather than the ultra short semidemiquaver (32nd note). For more examples of this “double dotting” see the article about Bach Cello Suite Nº 5, and especially the discussion about the Gigue. As we saw above, when we try and count how many dotted rhythms there are in a certain piece or movement, we quickly realise that, unfortunately, the definition of what is (and what isn’t) a dotted rhythm is not actually completely precise. When each note of a mini-group of two or three notes has a newly articulated note on its beginning, then the group is perfectly balanced, symmetrical, stable, “complete” and “undotted”. Prolonging a note over the next pulse in the group (by attaching a tie, slur or rest to it so that we are taken across to the following pulse without a new articulation) is what leads us into the new and wonderful worlds of assymetry: of both dotted rhythms and syncopations. A dotted rhythm effect can even be created simply by the melodic pattern of the notes within a constant slurred bow ….. But a rhythmic figure is not just simply “dotted or not dotted”. A dotted rhythm can be more or less dotted. This depends on the degree of shortness of the short notes in relation to the lengths of the long notes. 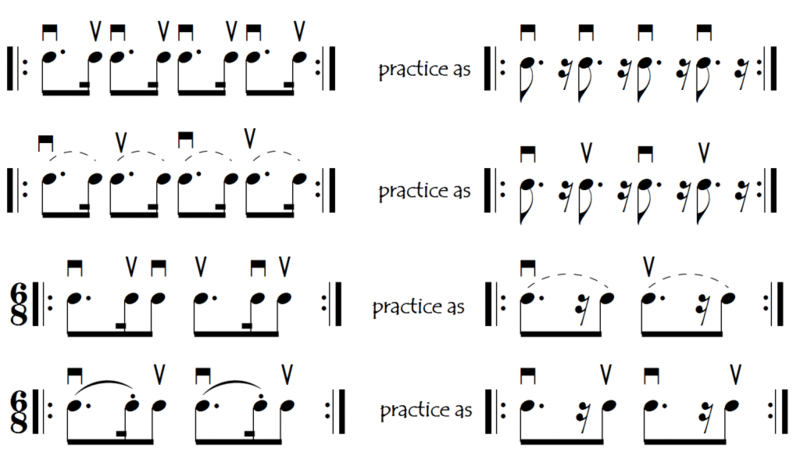 The greater this difference, the greater will be the “dottedness” of the rhythm as the following examples will show. In these examples we progress from completely undotted to extremely dotted. A triplet dotted rhythm is more relaxed than a semiquaver/dotted quaver figure. We have to be careful in a lot of classical music (in contrast to pop, swing, jazz etc) to keep our dotted rhythms crisp and tight (very dotted) and not let them become laid back triplets. As mentioned above, a good study piece for this problem is the Courante from Bachs D minor Partita for solo violin, in which the alternation of triplet quavers with dotted quaver/semiquaver figures is constant. Because of their unsymmetrical nature, finding a good bowing for duplet (not compound-time) dotted rhythm passages requires a little thought. These two problems occur because we are making repeatedly several steps in the one direction (usually in the down-bow direction) and only one back in the reverse (up-bow) direction. This means that it is mathematically extremely difficult to stay in the same part of the bow. If we have time to lift our bow off the string before (or after) the short note, then this allows us to retake the bow (bring it back in the air to where we want it) and we can do the bowing “as it comes” without any problems. It is in those passages with repeated duplet dotted rhythmic figures in which we can’t lift our bow off the string to retake that our problems with bow division occur. Here we need to use “hooked” bowings. With hooked bowings, each pair of dotted figures neutralises each other with respect to bow displacement, and the net effect on the bow position is zero: in other words we automatically and naturally stay in the same part of the bow. Hooked bowings are traditionally notated by a slur and a dot, but this can be ambiguous sometimes (for example when the short note is connected [legato] to the following note, or in inverted dotted rhytms) so we could also use a dashed-slur to better indicate hooked bowings. Whereas a “hooked” bowing would allow the long note to actually sound longer, this hammered ricochet bowing keeps all the notes equally short. There is nothing graceful or playful about a dotted rhythm when played in this manner! This may seem like a “backwards” bowing – don’t we normally play our short up-beats on an up-bow? Well yes, we do …….. but only when the note after the short up-beat needs to be played longer. In very fast dotted-rhythm passages in which both up and down beats need to be short, this “backwards bowing” allows us to get into an effortless, self-sustaining loop, in which the wrist is making its favorite anti-clockwise circles (which is what helps the bow to bounce effortlessly- see Spiccato). Try the same passage (or the same rhythm on any series of notes) with the opposite bowing and you will see how it suddenly becomes very hard work. Suddenly we are fighting against the natural tendencies of the bow. Now it no longer wants to bounce and, what’s more, it now wants to take us out away from the frog. André Navarra, curiously, preferred these “hard-work-bowings”. The triplet dotted rhythm figure however has exactly the opposite characteristics to the duplet version. When played “as it comes” the bow doesn’t gradually work its way out to one end. This is because each pair of figures has a neutral effect on the bows position, and thus the bow comes back automatically to where it started. When we do this figure with the hooked bowing however we are taking always several steps in one direction for only one step in the other so it is here, unlike with the duplet hooked bowing, that we are entering into unbalanced territory and need to be careful not to give unwanted accents on the last note of each figure. To avoid this mutation, we can either make the supreme effort to play the short note always as late as possible or we can play the bowing “as it comes”. It can be helpful to practice fast dotted rhythm passages without their “short notes”. This helps us to reinforce the basic bowing and rhythm of the “main notes”and to keep the little ones “little”.